I love the bumper sticker that reads “PRACTICE RANDOM ACTS OF KINDNESS.” It’s not as popular as it once was, so I don’t see it as much as I once did. But I believe the message is still worthy. Little acts of kindness are simple gestures of love that make us all more human. Every kind deed is another point of positive contact that strengthens our bonds as a global family. Wouldn’t the world be a far gentler and more beautiful place if we could live in a vast forest of kindness trees? 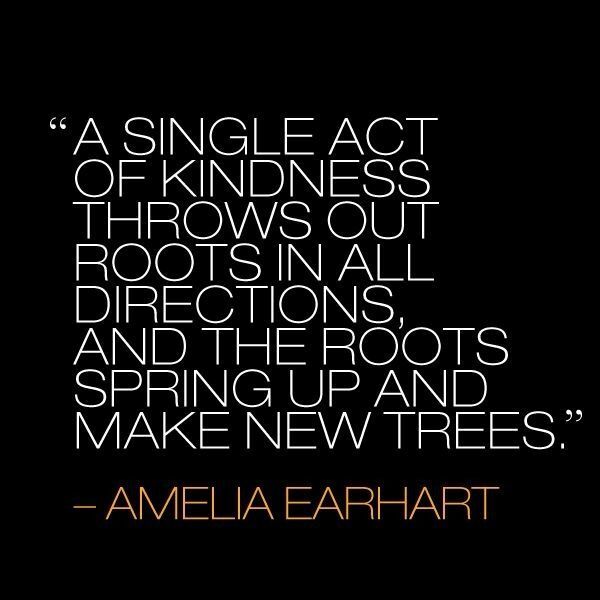 Will you join me in throwing out new roots of kindness today? Every act of kindness throws out roots in all directions. Working together we can create a vast forest of kindness. This entry was posted in News & Views, Quotes and tagged Amelia Earhart, bumper sticker, connection, forest, human family, kindness, love, random acts of kindness, roots, trees on May 8, 2015 by Ray Buchanan.